I had a client who was extremely busy and had not much time to cook (except on weekends). 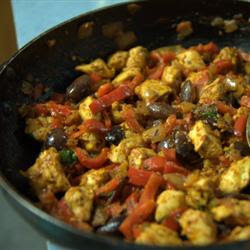 In attempts to increase his protein intake, recover and incorporate some whole foods, I made this modified Mediterranean Style Chicken recipe for him and adapted it to suit his needs/time frame etc. This is amazing if you have time to roast the WHOLE chicken in the oven, with diced tomatoes, zucchinis etc and let it soak in its natural juices. Those of us who don't have much patience- nor the motivation to spend time in the kitchen, this is a short cut to a great meal! 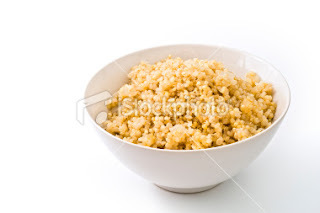 Traditionally, this is served with couscous , but since we were trying to increase his protein, I opted to use Quinoa . This is even better if the Quinoa is cooked in broth, or a mixture of broth /salsa , or the left over juice from the canned tomatoes etc. It soaks up the flavor. 3 TB lemon juice . Put chicken breast and 2c water in sauce pan . Cook for 8 minutes and dice. Add Quinoa to 1.5c water and simmer 15min until liquid absorbs. Optional: This is EXCELLENT if made with a bit of white wine and sundried tomatoes /eggplant!!! 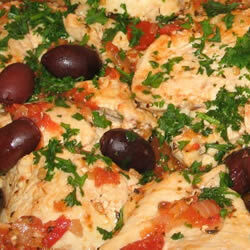 To increase fat levels, add olives and pine nuts ! I love love love quinoa. It's by far my favorite grain. Barbara, you leave the nicest, most genuine comments and I love that about you. I swear I feel like a million bucks every time! So thank you for that. I saw your comment on Julie Goleans blog , and loved the name of your blog and had to click on it, love the blog and eats! Ahhhhhhhh protien icecream is the best dessert, and I am loving this recipe on here!